I've been wanting to try this recipe out for awhile. It sounded a little too good to be true. So few ingredients to make a sweet treat? Boy was I wrong. 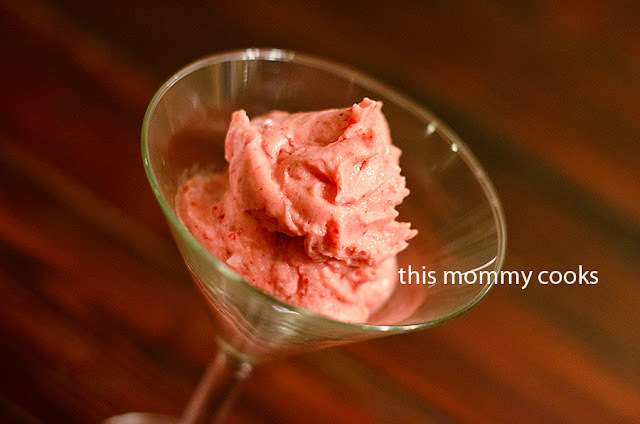 This ice cream is so easy to make, it's healthy, and it tastes great!! Another great thing? If you're dairy free, just use coconut milk! Just think of all of the flavor combinations you could make? I always have frozen fruit in the freezer, especially in the winter when it's harder to find cost friendly organic fruits. I made this for dessert for our family on the night of the Super Bowl. Such a nice treat. And one tip, don't freeze bananas in their peels, they don't come off! Slice them and then freeze them. I was thinking those little bags of mixed fruits that people use for smoothies would be perfect for this too! Oh the possibilities! Enjoy! Place the frozen bananas and strawberries into a food processor. Start blending then add in the vanilla and milk.As soon as the mixture is somewhat smooth check it out to see if it's blended. You want it to be thick, but smooth. Once it is smooth but still thick scoop it out and enjoy! This doesn't keep very well in the freezer, so it needs to be eaten right away. Oh WOW do I love this idea! Love the simplicity and using real fruit. So glad you shared.